Primavera P6 Activity Codes enable to make group and sort, filter activities by some specific value such as area, responsible manager, discipline, department, payment categories etc. Activity codes help to make effective reporting. By the help of activity codes, schedulers planning engineers and other users can create so many different types of reports. 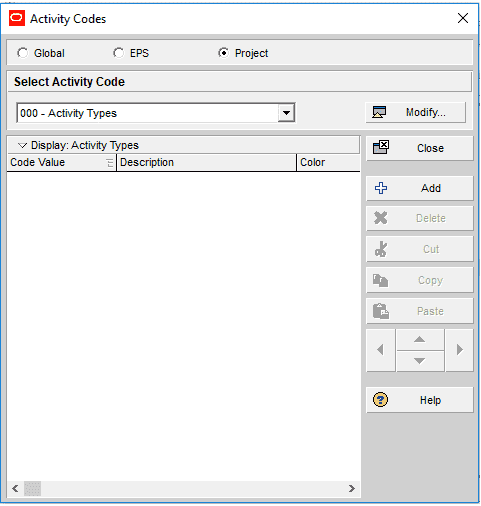 This article shows how to create and assign activity codes to activities in Primavera P6. Project managers and upper management often want to receive particular activity reports to understand the project performance in terms of categories. Therefore schedulers must use the activity codes to support reporting. WBS (Work Breakdown Structure) can be used for this purpose, however it is not adequate to create of a wide variety of reports . Activity codes allow you to organize activities into logical groups based on your project’s requirements. 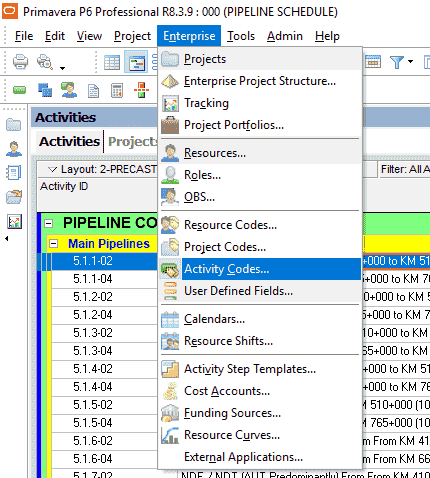 In Primavera P6, an activity code can be Global, EPS (Enterprise Project Structure), or Project. Global activity codes categorize activities across all projects within the organization. EPS activity codes categorize activities within a specific node of the EPS (Enterprise Project Structure). Project activity codes categorize the project activities based on specific groups and deliverables or features within a project. In Primavera P6, you can create many activity codes according to specific requirements and assign them to the activities . For instance let’ s say your project has several departments and you want to review the performance of each department by analyzing the activities which are under their responsibility. For this purpose, first thing is to create an activity code and name it as department. You can first create an activity code “department,” then assign different values such as quality, project control, health and safety, and sales under this activity code. Then you will group the activities of specific departments. Once you create the activity codes and assign them, you can easily group, sort and filter the activities . For better understanding, let’s take a glance at the example below. Assume that we have a sample pipeline project as displayed in the Figure 1. As shown in the Figure 1, we have mainline activities such as Pre-Construction Survey, Clearing and Grading, Welding, NDE/NDT etc. and the project manager demanded a report which is organized by specific activity groups. In order to do this, we will define activity codes and assign them to each activity. To define the activity codes, select Enterprise | Activity Codes as shown in the Figure 2. We will select “Modify” button in the Activity Codes window as shown in the Figure 3. 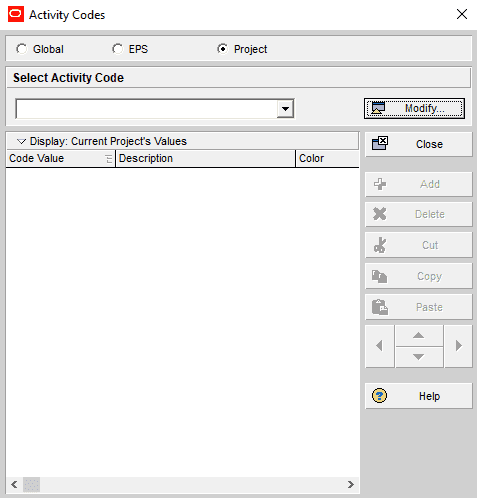 We will select “Add” button in the Activity Code Definitions – Project window as shown in the Figure 4. We will type “Activity Types” for the code name and select “Close”. 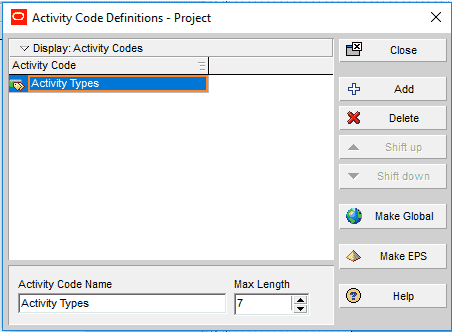 Then we will turn back to Activity Codes window and see the Activity Types code as shown in the Figure 5. By selecting “Add”, we will define all the activity types such as Pre-Construction Survey, Clearing and Grading, Welding as shown in the Figure 6. After creating all the codes, we will close this window and turn back to the assign them. The easiest way of assigning activity codes to the activities is to use the columns. To do this, we will add the column “Activity Types” to the activities table, and assign the activity codes that we defined at the beginning, Figure 7. As shown in the Figure 8, all the activity codes are assigned to the activities . Now it is easy to filter, group or sort them. Now we will use the group and sort feature to display activities under specific groups. Select View | Group and Sort by from the main drop down menu at the top of the screen. Under the “Group By” we will select our newly created “Activity Types” option and toggle hide if empty and sort bands alphabetically group by options as shown in the Figure 9. Figure 10 displays our pipeline project grouped by “Activity Types”. Creating the WBS (Work Breakdowns Structure) and associated deliverables is an important step in the planning phase of a project schedule. 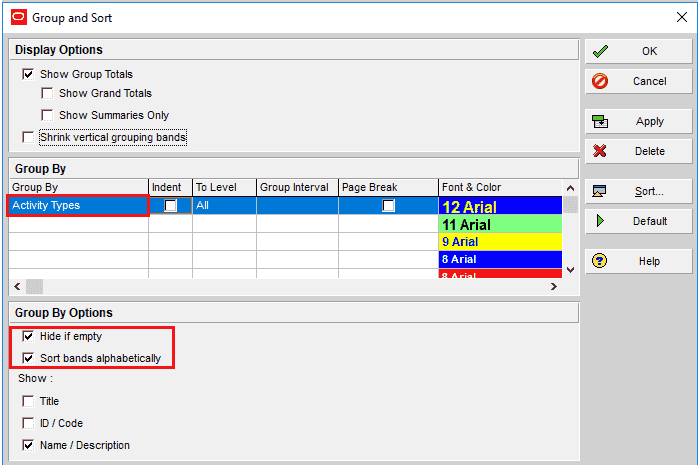 You can create WBS (Work Breakdowns Structure) to group the activities under specific levels of your project. However, WBS itself may remain incapable of grouping and sorting activities for specific needs. 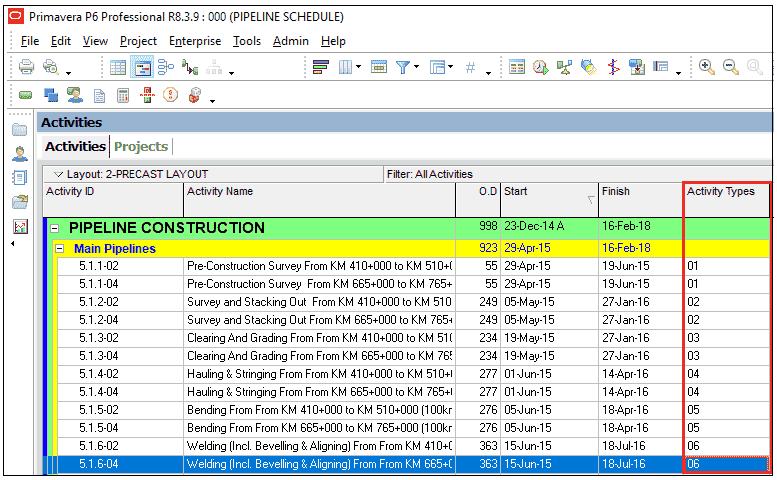 Activity codes represent wide categories of information, such as deliverables, responsible engineers, or phases. Primavera P6 Activity codes feature enables to create infinite possibility of activity codes. 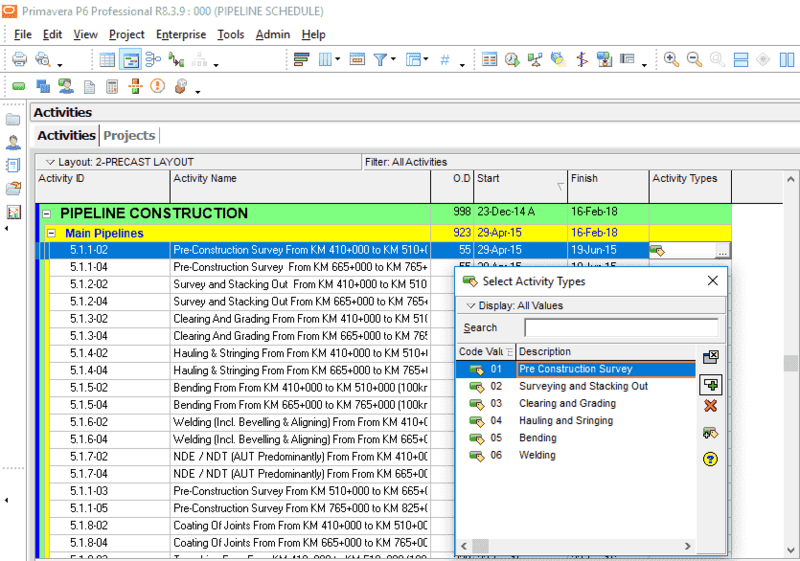 In order to prepare explanatory reports for project management, it is critical to assign codes to activities for filtering and grouping them. 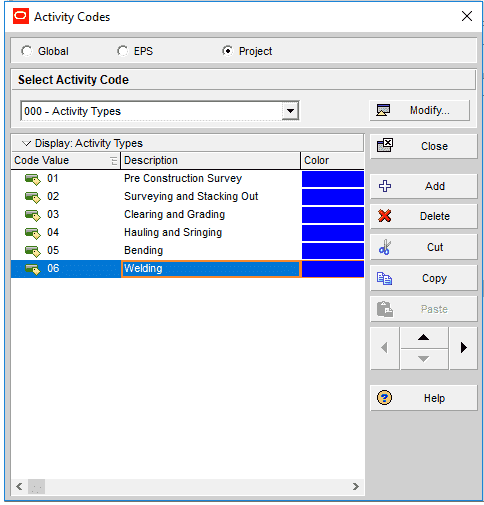 In this article we discussed Primavera P6 Activity Codes and their usage. We hope that it will be useful for the professionals who are working in the field of project planning and scheduling. You can share your comments and experiences by using the comments box in below. Hi, like your article, but have a query. Let’s say if one activity involves TWO or THREE activity types, when you try to assign code value to this activity code, only ONE code value is allowed. Is there any way to assign multiple code value to an activity code? I think your question is about assigning activity codes instead of types. It is possible to assign multiple activity codes to an activity.